Buster Keaton. Marion Mack. Glen Cavender. Jim Farley. Joseph Keaton. Comedy. Classics. Silent. Critics' Top 100. Trains. Recommended. Guardian 1000 Must See (2007). AFI Top 100 Movies Ever. Peoples' Choice. Arguably Keaton's finest film, and rated as one of the funniest comedies ever made. 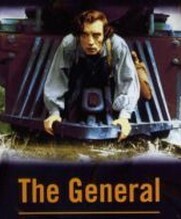 Keaton is the Confederate train driver who refuses to hold up the white flag when his engine is hijacked by Union soldiers during the Civil War. The visual gags come thick and fast as Buster fearlessly risks life and limb in a desperate race to claim back his train, and his girl! A classic.